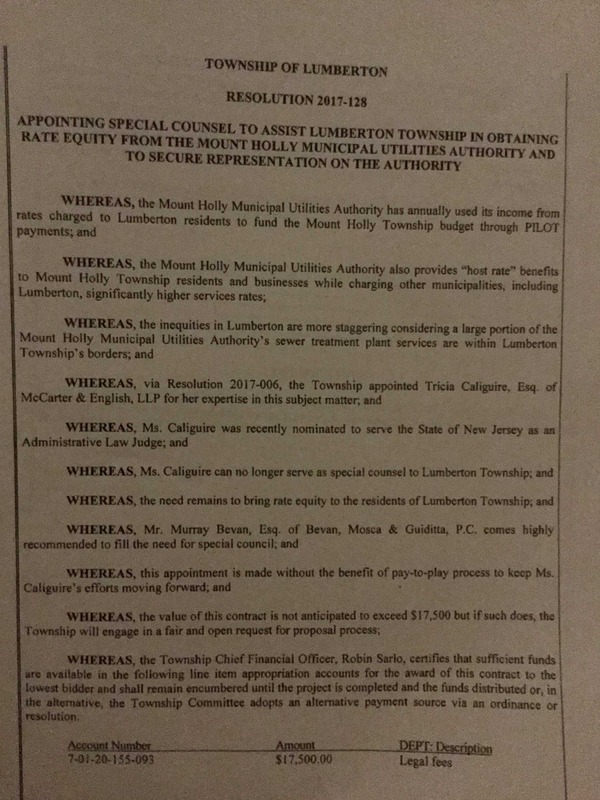 Attorney Tricia M Caliguire served as Special Counsel to Lumberton Township, exclusively for dealing with issues related to the MUA. In June, Governor Chris Christie appointed her to a judgeship, a position that requires her to stop all private law practice. She resigned from the special counsel position on July 14, and the township tonight appointed a new special counsel to take her place. The new counsel is Murray Bevin of Bevin, Mosca & Guiditta, P.C., whose term begins immediately, and runs through the end of this calendar year. 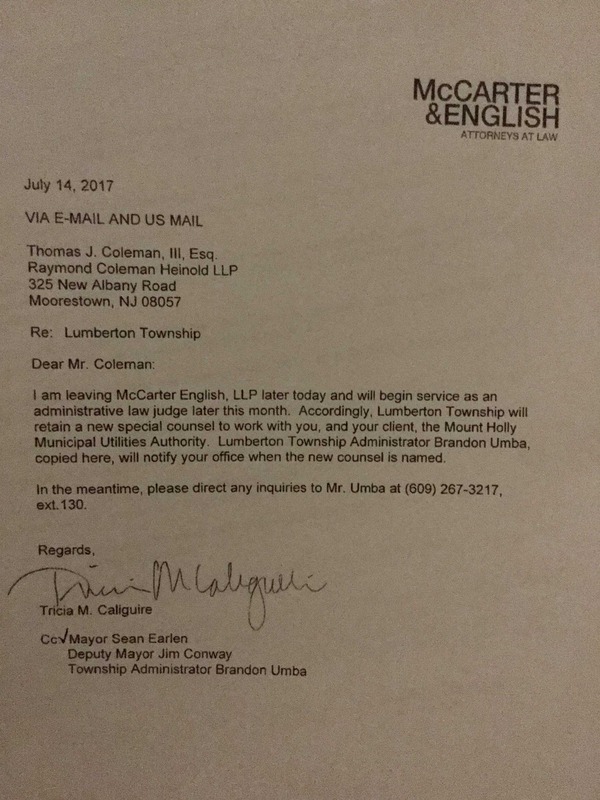 Reports that Lumberton has stopped retaining their counsel because they have no valid case to pursue is inaccurate. Mayor Sean Earlen made a point of saying that the township is continuing to aggressively pursue the matter. The council noted that there were multiple MUA bills that the township has so far refused to pay. These bills are specifically for the water in the township building and some bathrooms in public spaces. It was stated that these bills add up to around $500 a quarter. Tonight it was decided that all 2016 bills would be paid “in protest” but that no 2017 bills would be paid. It was also stated that there are no penalties on any of these bills, and that the new special counsel would be sending a letter to the MUA to express the protest. According to an OPRA request, the PILOT money being directed to Mount Holly Township started in 1978 in the amount of $24,000. It is now hundreds of thousands of dollars. There are reports of the controversial Mount Holly Municipal Utilities Authority (MHMUA or MUA) postage and handling fee partially being used for the cost of reading the meters. It was stated that reading meters costs dramatically less than the tens of thousands of dollars brought in by the fee. The board stated that when Gina LaPlaca was appointed to the MUA as a commissioner, the council was unaware that a commissioner position was even available at the time. Some residents are reporting being charged for a “disposal fee,” which is specifically geared towards those with an in-sink mechanical disposal unit. Citizens’ Media TV has also received a report of a resident stating that he’s been charged with this fee for years, despite the fact that he had no disposal. It is unclear what mechanism or procedure the MUA uses in order to determine whether a resident does or does not have a disposal installed.